Warning: please take out the card on the DVD drive lens before playerback. 9" Digital TFT Screen Resolution 800*480. Region Free DVD Player with 270° swivel screen panel, and it can support DVD/SVCD/VCD/DVD-5/CD/CD-R/CD-RW/DVD-9/DVD±R/DVD±RW. Built MTK chip, the stablest chip ever used in portable DVD players. 2600mAh Lithium battery which can last for 5 hours, enjoy your movies much longer. Built-in USB/SD/MMC card read port, supports up to 720*576 resolution AVI video playback and MP3 and jpg format. Expand your media choices by plugging your USB stick or SD card into this unit to play music, video or view photos. Please format your drive as FAT32, not NTFS, and not exFAT, then you can play video from flash drive ranging from 4GB to 128GB. Note: the video files in the USB/SD card should be within 4GB. Customized 3m-long wall charger and 3m cigarette charger and car headrest mount case to make it more convenient to you. package comes with a headrest mount case for in-car use. The 270 degree rotating and 180 degree flipping design makes it perfect for your home, car, etc. Flip the rotation of the screen can give you the best viewing experience of maximum Angle. 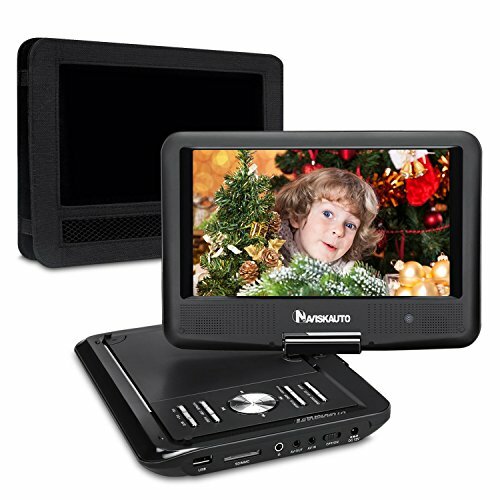 The built-in 5 hours rechargeable battery makes the DVD player work at anywhere you are. The screen swivels and rotates 270 degrees for easy visibility. You can get a perfect view in the backseat of the car or use it like a tablet screen for outdoors. We believe in our products. That's why we back them all with a 12-month warranty and provide friendly, easy-to-reach support. If you have any questions about this product by NaviSkauto, contact us by completing and submitting the form below. If you are looking for a specif part number, please include it with your message.